Maximises energy yield from every hectare grown to lower the cost of production, whilst producing high quality silage that reduces bought in feed costs. With excellent early vigour growing Ambition ensures maximum performance in all conditions. Ambition combines high DM yield with improved cell wall digestibility to deliver high ME yields, reducing purchased feed costs. Ambition is a Limagrain Animal Nutrition (LGAN) accredited variety. 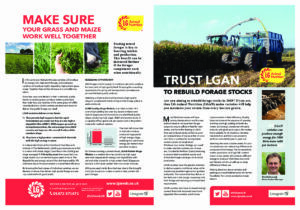 Maize on arable farms could be an attractive option this season for use as AD feedstock or for livestock feed.